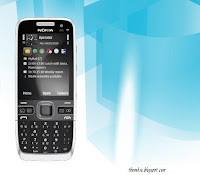 The new and great features of Nokia with The Nokia E55 is it fits great messaging features, including a compact qwerty keyboard, into a remarkably convenient design. - Convenient qwerty, that you can write messages quickly with the compact qwerty keyboard, and make the most of the new predictive text engine, which completes and corrects your typing automatically. - Take advantage of fast internet connections with 3G, HSDPA/HSUPA and WLAN to reach colleagues, businesses and information, and acces files on your PC remotely. - Network and socialise with email and instant messaging, browse the web, and share content with your friends on the most popular social networking sites. - Discuss your business at length with up to 8 hours of talk time (GSM) and up to 31 days of standby time (GSM). - Be heard with active noise reduction - this removes background noise when you call from noisy environments.